Room is a small room program, can be used to add 'ambience' to vocals. Chamber is an echo chamber program. Hall is a concert hall program. The Reverb effect is typically used in an Effect Return section. Rvrb time controls the reverb time. Mix mixes the wet (ie. reverb) and the dry (ie. input) signal. 0 % is dry only, 100% is wet only. 100% will typically used if the effect is used in an Effect Return section. Width controls the stereo width of the reverb. Pre Delay controls the time it takes for the first reflection to appear. The Color section contains controls that affect the tonal character of the reverb. Lo Mult is a multiplier for the low frequency reverb time, while Lo Freq sets the frequency below which Lo Mult is active. Hi Cut sets the frequency above which the reverb time is decreased gradually. If Spin is not zero some of the reverb algorithm's parameters are modulated with a low frequency signal. 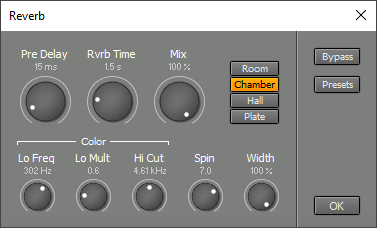 This makes the reverb more random and smoother. Too much Spin will introduce noticeable pitch shifts in the reverb (easily noticeable on piano parts). Percussion parts may benefit from a higher Spin setting.